Dhaval was a mathematical child prodigy who came to attention in his youth for his ability to calculate very fast. Although he graduated as a lawyer, he decided to enter the world of teaching. He is on a global crusade to eliminate the phobia of mathematics among young learners, and has taught in many countries, including Kuwait, UAE, USA, UK, Oman, Nepal, Sri Lanka and Singapore. He has advised the governments of India and Mauritius on policy matters in education, and has received 16 national and international awards and titles for his work. Though only 32 years old, he has published 5 books (available in 14 languages) and 19 CDs for teachers and students. He has taught in 345 different schools around the world and personally trained over 12,000 teachers and one million students. 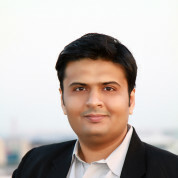 Dhaval also holds the Guinness World Record for teaching the most students in a single venue. He is now writing his sixth book, including over 70 innovative ideas on improving the classroom environment. Rather than being based in a standard school, he took over his mother’s training school, Genesis Education. The organisation is financed by the royalties from Dhaval’s book sales, and offers free classes for teachers and students focusing on mathematics, memory enhancement and 3D learning. Games are used to solve puzzles in probability and other fields, and the 3D videos on topics like the solar system and molecular biology are so engaging that students recall the content with ease. Join the #TeachersMatter movement by sharing Dhaval Bathia’s update.